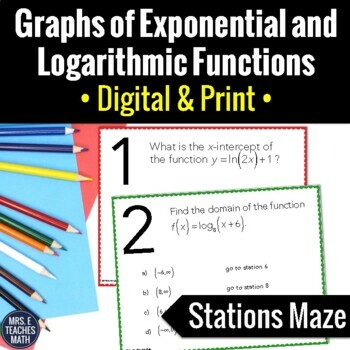 In this activity, students will practice finding information from graphs of exponential and logarithmic functions. 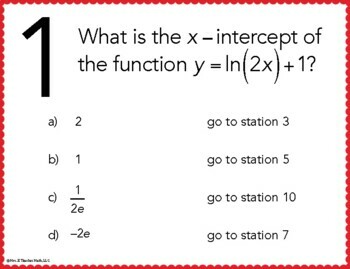 Students will answer questions about domain, range, x-intercepts, asymptotes, and inverses of the functions. 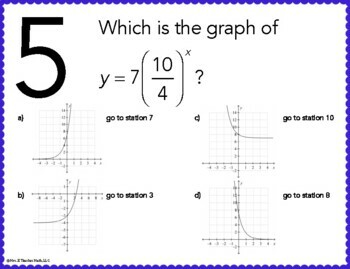 Some of the questions give graphs and some of the questions give equations. There are 11 stations. Make sure these problems are appropriate for your students - download the preview and look at the thumbnails to see problem examples. 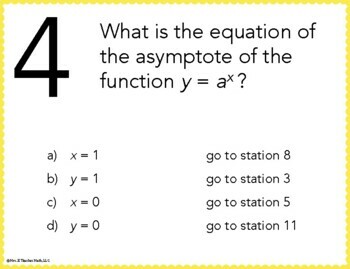 This activity can be completed individually or in pairs. A student answer sheet is included. Two versions of the maze are included: color and black and white. The differences are shown in the thumbnails.